Design | read. write. teach. Lady Gaga’s latest single, Born This Way, came out a month or so ago. It’s the first track to be released from her upcoming album. Being the little monster that I am, I of course downloaded the song from iTunes the day it came out, happily handing over my $1.29 plus tax. A few days later I bought Avril Lavigne’s first single off of her upcoming album. (Are you noticing a trend related to my inability to practice patience?) These are both albums that I want to own and that I normally would have at least considered purchasing at the store and then transferred to my computer. Except now I’ve gone and put money essentially toward the strictly digital creation of the music. And since I’ve become a bit obsessive about saving money, it makes more sense for me to just use the awesome little Complete my Album option in iTunes. Except I love album art. I do. I love it. I love looking through the entire design that goes into packaging a CD, from the liner notes to the back of the case to the font that’s used on the actual CD itself. That little image you get in iTunes, that shows up on your iPod—it’s cool and all, but I really like getting those extras in tangible form (plus, you usually get lyrics when you buy an actual CD). So that said, I’m thinking I might just go ahead and buy these albums at Best Buy or somewhere. There are worse things to pay for than art. 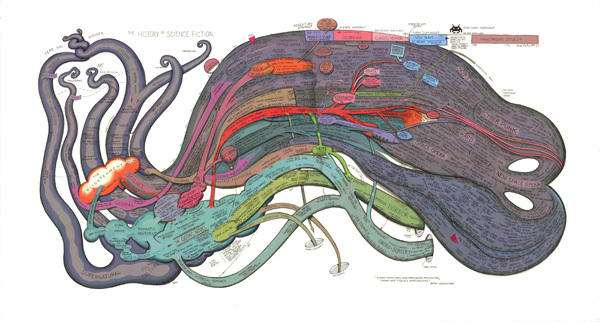 Check out this amazing hand-drawn infographic detailing the history of all that we might call science fiction. See the full sized image here and enjoy. One of my Day Zero goals is to do 15 different design tutorials. As I only recently acquired Adobe CS5 (thanks, Danielle! 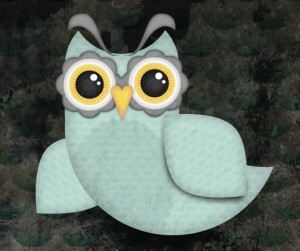 ), I’ve spent the last year or so saving interesting looking tutorials, but last week I finally finished my first one. If you’ve got any interest in this type of stuff, definitely be sure to check out Chris Spooner’s awesome blog; the owl you see here comes from following one of his tutorials.